...bring new opportunities to The Studio Yoga! Maha gratitude to all who took the time to take our surveys! We are pleased to offer our students three NEW opportunities for you to explore balance and wellness in your life this Spring- Group Health Coaching, Tai Chi and Meditation! For information on these new offerings you'll want to scroll down and click to sign up for each! 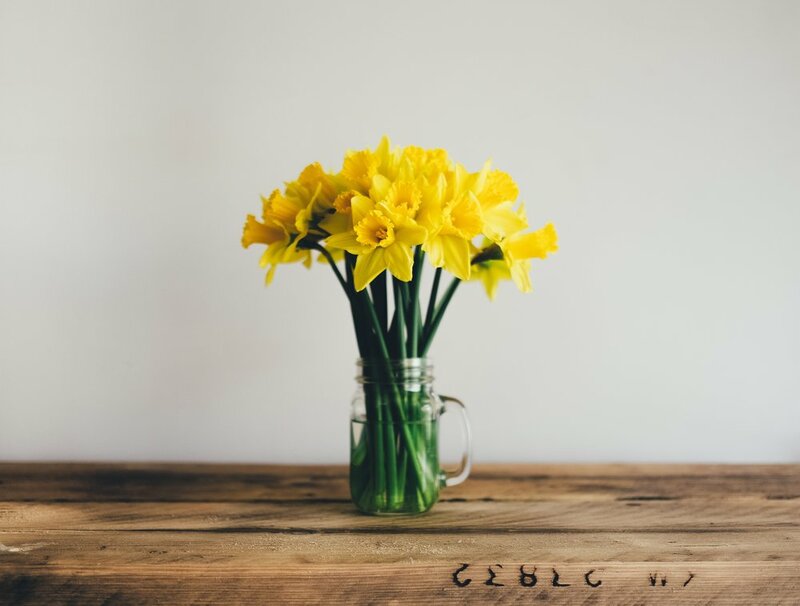 As Spring has officially sprung, we look forward to seeing more of you popping in for class! 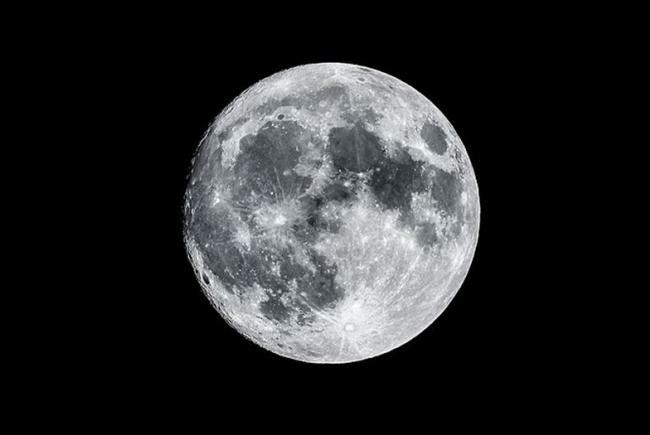 The full moon increases the intensity of our work here on earth - develop subtle awareness of self to identify and release blocks in your physical, emotional, mental and energy bodies. 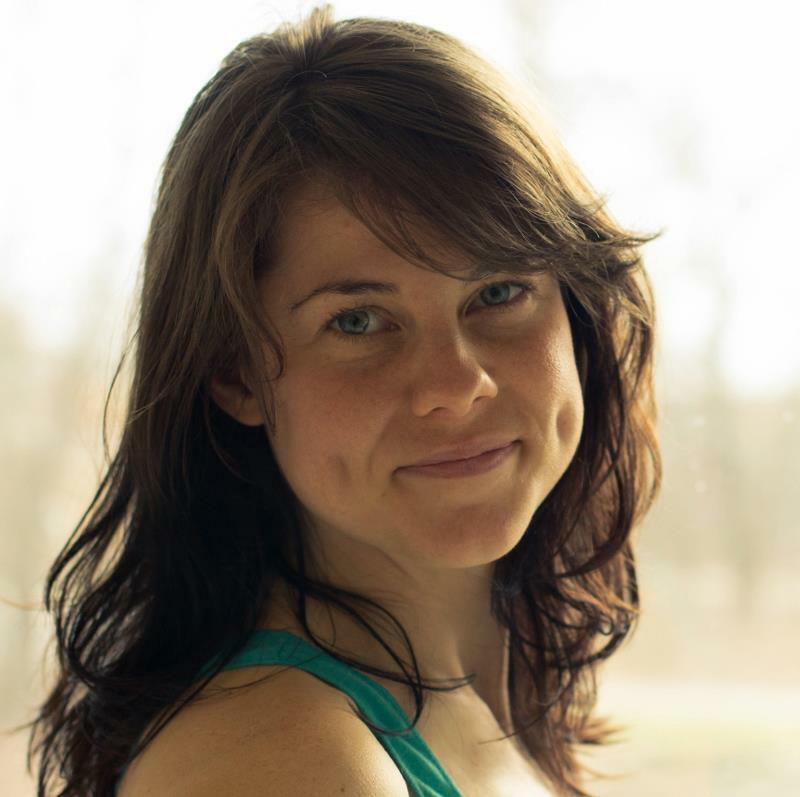 Jennephyr will lead you through an exploration of Chandra Namaskar [Moon Salutation] and floor-based Yin Yoga postures to help you settle into your body and use your breath as a guide to deep surrender. Space is limited to 12 students, sign up today! To be healthy isn’t just to pass a medical exam or avoid illness, but rather to thrive. As we seek to live healthier lives, we will look deep within ourselves as well as learn concrete information about food, exercise, self-care, and daily habits. Groups will meet once a week for four weeks. Participants will also have an individual phone consultation with Angel. We will have a focus for each week that will guide our personal development. After the completion of the four weeks Angel will follow up with participants weekly for support and accountability. Angel Hayden will guide you on your journey. She is an Ayurvedic Health Practitioner, personal trainer, and yoga instructor. She has spent the last decade of her life immersed in an ever-evolving journey toward balanced, healthy living. In this 4-week mini-series we will explore both Mindfulness Meditation and Tai Chi. We will teach you the health benefits of both and give you the tools to assist you in establishing your own home practice. Mindfulness means maintaining a moment-by-moment awareness of our thoughts, feelings, bodily sensations, and surrounding environment. It also involves acceptance, meaning that we pay attention to our thoughts and feelings without judging them. 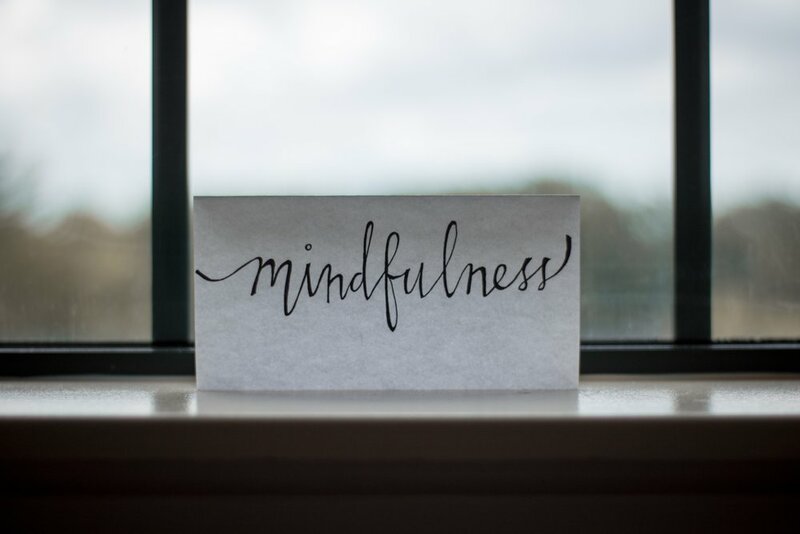 When we practice mindfulness, our thoughts tune into what we are sensing in the present moment rather than rehashing the past or imagining the future. Scientists have discovered that mindfulness techniques not only help with relieving stress and improving well-being, but can also be used to improve your overall health. This introduction will teach those techniques. Tai Chi is an ancient practice that may help improve balance and is often hailed for its stress-relieving effects. Often referred to as a form of “moving meditation,” Tai Chi has been found to enhance stability and decrease fall risk in many scientific studies. Long used in traditional Chinese medicine, Tai Chi is a mind-body technique that involves carrying out a series of slow, gentle movements. In this introduction, we will teach you the health benefits of Tai Chi exercise, take you through a guided breathing relaxation, teach you the basic principles of Tai Chi postures and several Tai Chi flows you can practice at home. Denise will also demonstrate the full 8-form sequence that is taught in our Tai Chi: Moving for Better Balance course. Who’s ready for Spring already??!! We’ve had a pretty rough Winter this year and Spring is hiding just around the corner….It may not feel like it, but if you’re paying attention, you’ll notice the subtle signs of spring - One student even noted seeing a robin recently! Have faith, Studio Yogis, Winter does not last forever. Just like the seeds we plant in winter root, rest and restore, soon fresh growth will be popping up out of the soil - we hope you, too, will be popping in for class soon! Just as nature enters a cycle of renewal, growth and expansion—so does the energy within us. Spring is an expression of life in it’s youth. By bringing new energy into the light we let go of all that no longer serves us and prepare to bloom into action. In Spring, we plant seeds for a future harvest, to look ahead and make new plans, formulate new ideas, make decisions, and determine our direction for the coming year. In traditional Chinese medicine, WOOD is the energy of Spring and associated with the liver and gall bladder organs. We will explore these concepts to help restore healthy flow of qi (chi) to support the body's metabolism and natural ability to eliminate toxins and waste. 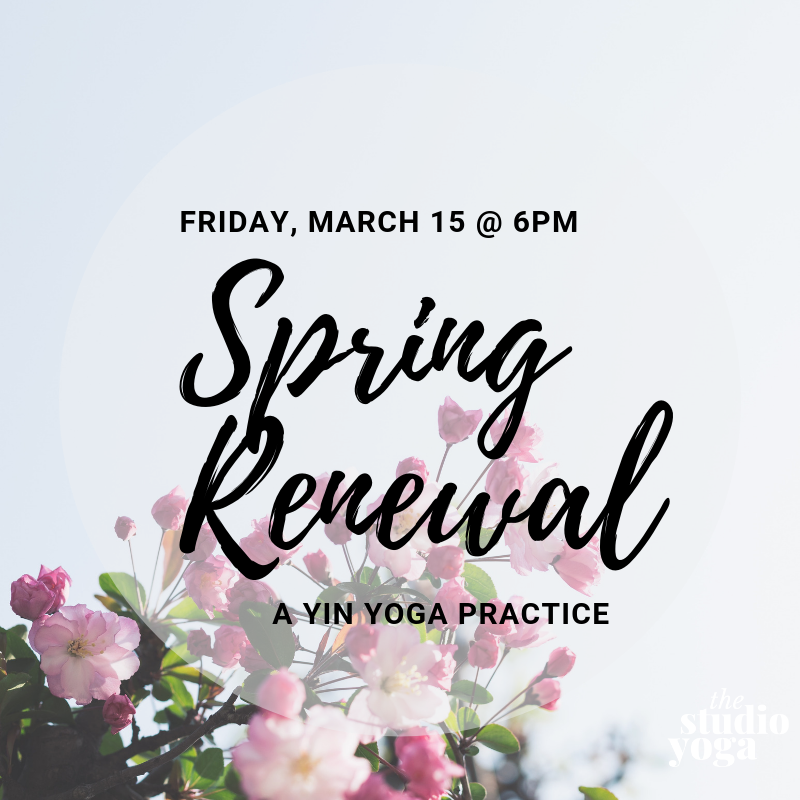 Join us for a 90-minute Yin practice to celebrate this introspective transition of Winter into Spring. Bring a journal, if you like, for reflection/contemplation during or after class. This class is suitable to All-Levels. We have space for 15 students. Pre-registration is required. Mandala - a design that radiates from a central and unifying center, a sacred circle. It is a symbol of wholeness. Vinyasa- to place in a particular, or sacred, way. 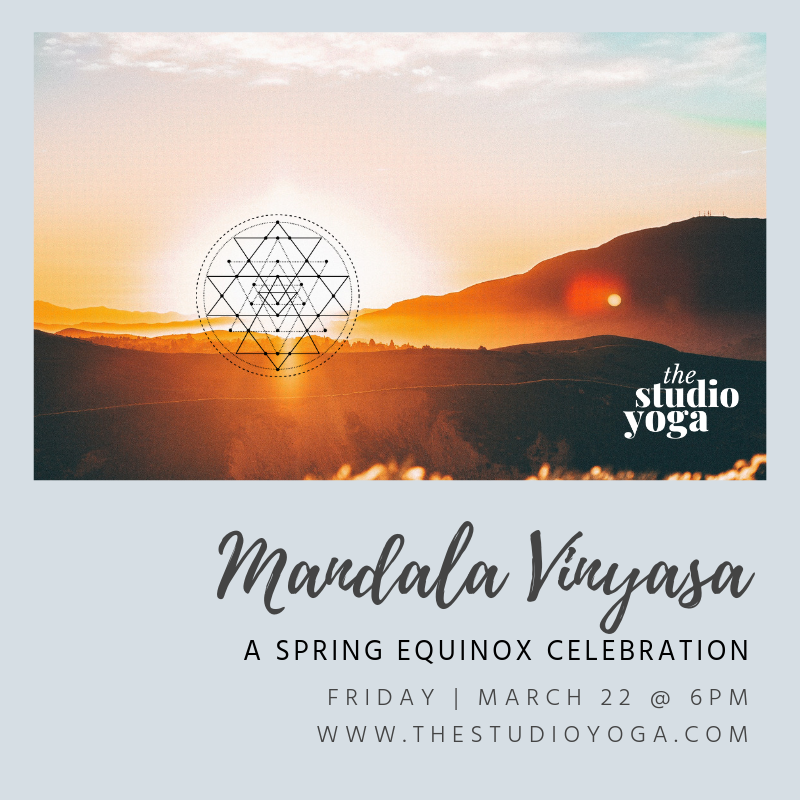 Welcome Spring with a Mandala Vinyasa practice to celebrate the Vernal Equinox, marking the beginning of Spring in the Northern Hemisphere! This 90-minute yoga practice mimics the spiral patterns in nature to explore circular movement around the mat. We will explore the balance between darkness and light, sun and moon, masculine and feminine, to honor this time of year when we experience a balance of day and night. We will end our Mandala practice with a 20-minute Yoga Nidra "meditation." This is a moderate yoga practice, some experience with the Vinyasa practice is highly recommended. This event is open to 15 students. Pre-Registration is required. Join us for this 2-hour deep dive into the practice of Surya Namaskar. You'll learn the history and practice of the sun salutation, as well as modifications and adaptations to truly make this sequence work for you in your body. This is a beginner-to-advanced friendly class. Perfect for those wanting to hone their salutation skills. This class is open to 15 students. Pre-registration is required. 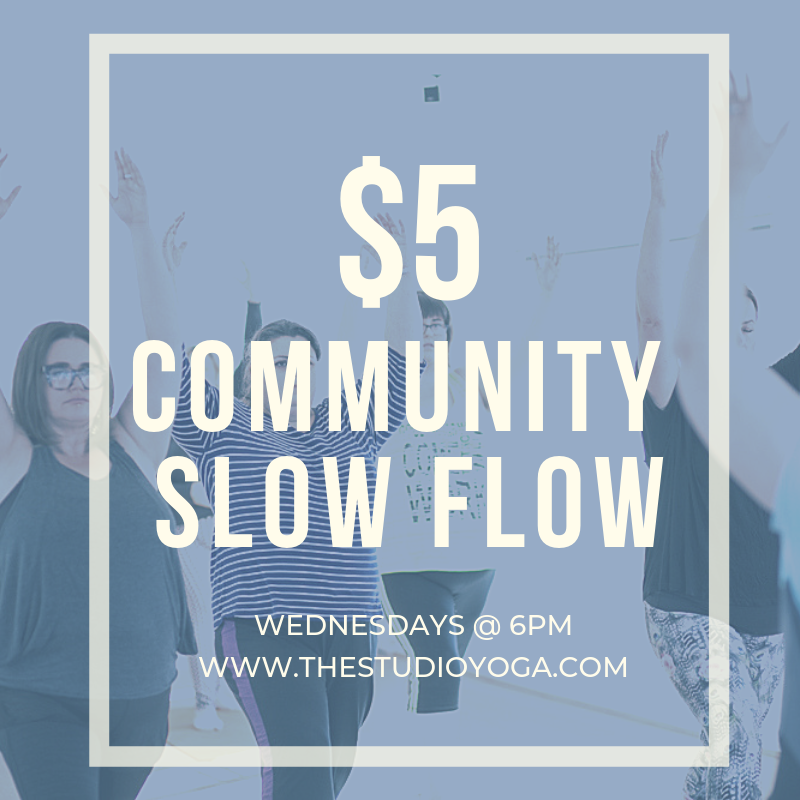 $5 COMMUNITY SLOW FLOW CLASS IS BACK!!! Starting in March, Our Wednesday evening SLOW FLOW class is now only $5 to drop-in!! We aim to make yoga accessible to all, regardless of finances. Please join us!! Bring-A-Friend in March and get a $20 credit! Share your love of yoga and The Studio Yoga with your friends and family - If you bring a friend in March - YOU get the credit! $20 will be applied to your account which can be used for your next autopay or class pass purchase!! Your Friend must be NEW to The Studio Yoga and must purchase a New Student Intro Offer (30 days of Unlimited Yoga for $39) that same day. We’re looking for a more permanent day/time for our meditation class and could use your input - if you’re interested in meditation or think you might be interested, please take a few minutes to take our quick survey. We’ll compile the answers over the next few weeks and we’ll add meditation back to the schedule in April. 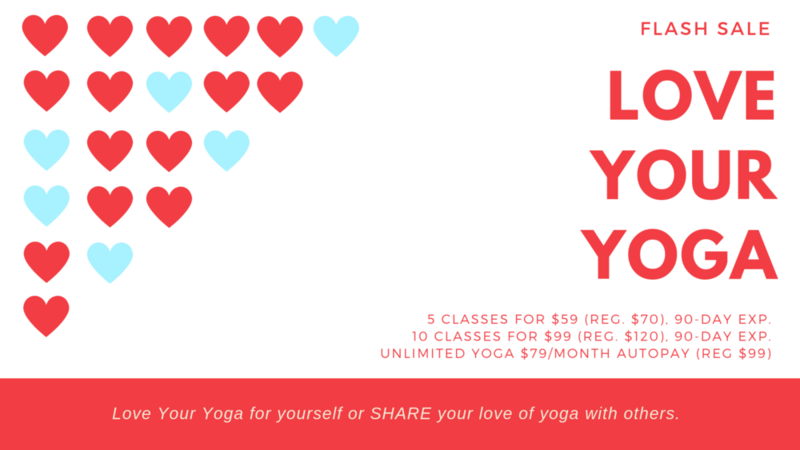 If you haven’t gotten your sweetie anything for Valentine’s Day, nothing says “I Love You” like yoga classes at The Studio Yoga! Special pricing available thru February 15th. Thank you everyone for your patience - we attempt to limit the number of classes we cancel in the winter and really felt closing The Studio was best for our students, staff and greater community. We hope you’ll be able to make it to class Thursday (please, use your best judgement). We really hope this is the last time we have to make this announcement….The Studio will be closed Wednesday, January 30th due to the Winter Weather Warning for our area. It is advised that we stay off the roads, if possible. ALL classes are canceled for the day. As much as we were hoping to open The Studio for classes this afternoon/evening, it is advised we stay off the roads unless essential. Classes are cancelled for the rest of the day. This includes the 4:30p SLOW FLOW, 6pm VINYASA and 7:35p RESTORE. We apologize for the inconvenience but feel it’s best for our community. We will assess tomorrow’s storm warning tonight and will post any cancellations on our website (both in NEWS and SCHEDULE) and our Social Media no less than two hours before scheduled class time. We are cancelling our Monday evening classes for tonight and tentatively our Sunrise class Tuesday morning. The schedule on our website and the MINDBODY App has been updated to reflect this evening’s change. We will continue to update both our website and social media. 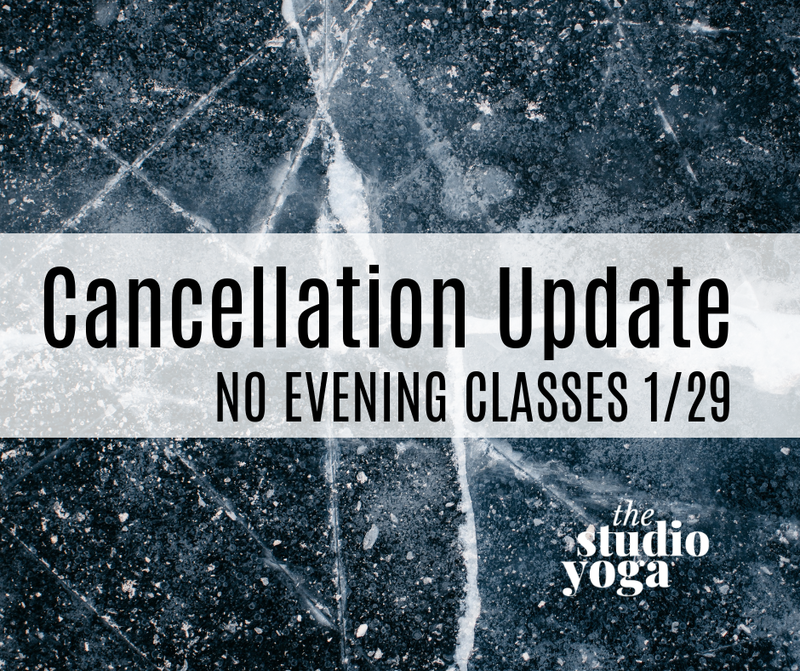 Due to the Winter Storm Warning in our area today, we are cancelling our Monday morning classes at The Studio Yoga. Please be safe out there if you need to be out on the roads today. We’ll make a determination later today regarding our evening classes - stay warm! The holidays are over and it’s back to our routines- or NEW routines, if you’re harnessing the energy and momentum of the new year - We are here to support you! Whether you’re looking for a place to ease your body and mind or needing to build strength and flexibility to complement your daily activities, we’ve got a variety of classes and instructors to guide you. Monday’s- We are in the process of filling our 6pm slot but haven’t locked it in. We will update you when we’ve got news. Wednesday’s - RESTORE has been moved to Tuesday evenings (see above). Saturday’s - MEDITATION will start January 19th at 9:15am. We will offer this FREE 20minute class between our FUNDAMENTALS at 8am and VINYASA at 9:40 (class time to be adjusted starting 1/19/19). Stay for meditation post-FUNDAMENTALS or come meditate before VINYASA! *changes are effective this week, January 7th, with the exception of MEDITATION, which begins next week, January 19th. Look for our newsletter this week in your inbox for other exciting workshops and events this winter! 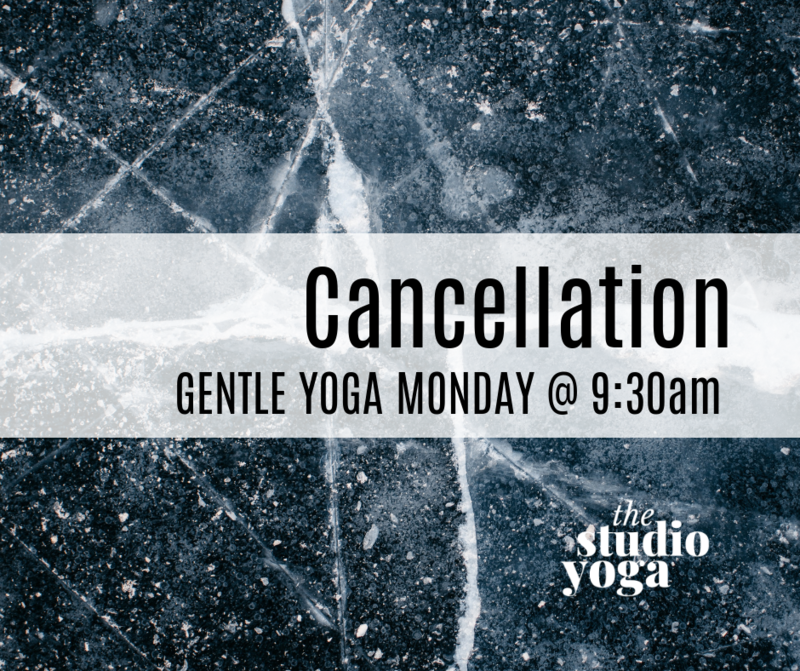 Due to the weather advisory, we will be canceling our GENTLE YOGA this morning at 9:30am. We’ll keep you informed, both on our Facebook Page and our website regarding any changes to the evening classes. The week of Thanksgiving is upon us and there is so much to be thankful for! As we near the end of the year, we will modify our schedule a bit over the holidays to give students and staff time off to be with family and friends. This Thanksgiving week, we plan to run our schedule as normal with the exception of Thanksgiving Day. All regular classes are canceled on Thursday November 22nd. 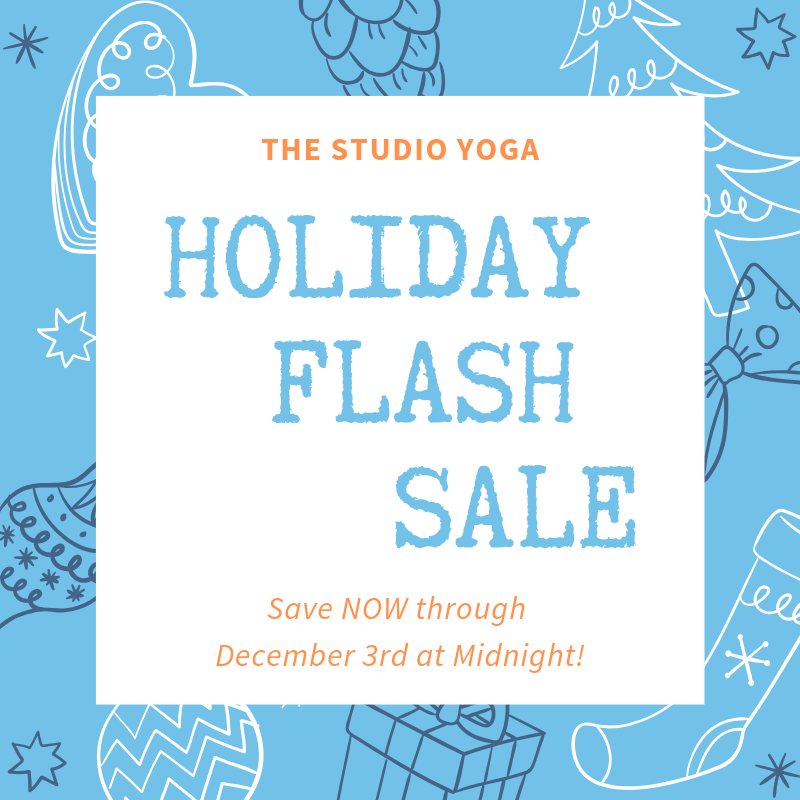 We will offer a SLOW FLOW class at 8am for those who want to get in a yoga practice before their festivities. Our ALL LEVELS Thanksgiving Day class will be taught by Katie Dunlap. This is a donation-based class meaning, the class is free to attend - any donations offered will be donated to Feeding America of West Michigan. Class size is limited so be sure to pre-register for class so we know how many will be attending. Although Summer hasn't officially come to an end, the kids are back in school and we're feeling that familiar pull to get back into a routine. Instead of fighting the end of Summer - embrace this beautiful time of transition! Clean out your closets, Change your diet and Fall Back in Love with your Yoga Practice. Our new schedule starts Monday September 10th. this is our last sale before Christmas! The sale will run through Sunday September 16th @ Midnight! We will be raising the price of our Unlimited Yoga Membership in October and changing the commitment minimum commitment from 3 months to 1 year. you will NOT be effected by the increase. now is the time to do it! Our current monthly membership is $79/month - that's as low as $2.39/class!!!! at our current price today! This option is our most popular membership option, striking a perfect balance between availability and cost. With this membership you get unlimited access to all of our regularly scheduled classes. And includes a free guest pass each month so you can bring a friend! Need some inspiration to get back on your mat? Check out our workshops and special events this Fall! Whether you're just beginning your yoga journey or have been practicing for years - there is something for everyone. for a 45-60minute walk around our neighborhood. It's a great way to get to know fellow yoga students, gets your heart rate pumping and gets you outside in the fresh air. call or email your suggestion to info@thestudioyoga.com. Interested in a private session for yourself or a loved one? Need an team building event for your work group or a private party? No longer wish to hear from us? Click here to opt out. Jennephyr Meier Yoga LLC DBA The Studio Yoga, 933 52nd Street SE, Kentwood, MI 49508, United StatesYou may unsubscribe or change your contact details at any time. This is our LAST SALE before Christmas - Sale ends Sunday September 16th at Midnight. 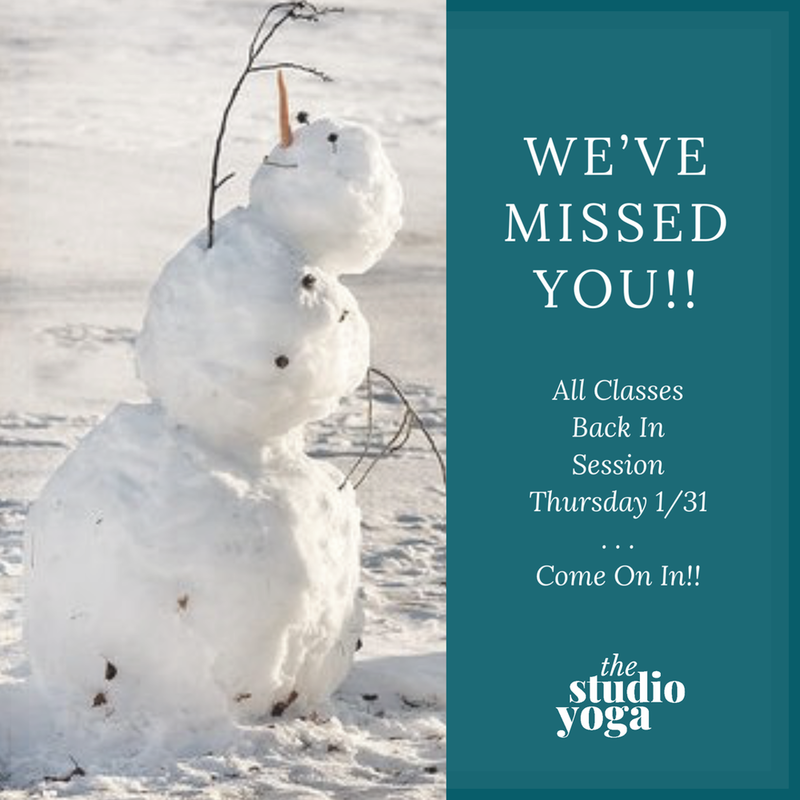 We’ve added a few of your favorite classes back to the schedule, added a NEW Happy Hour class to Friday evenings and tweaked the time of our Gentle class on Wednesday mornings. Come check it out!